Yeah i'm getting similar results. Yeah, I've been experiencing this, but only in Gmail for Business - not in my personal account. A few others have reported it too. Do not know what's going on. Hi Everyone, unfortunately I still haven't found a fix for this problem but we're not alone. You can also track this issue on the Gmail Help Forum. I'm having issues finding any sort of gmail support emails or gmail websites where I can submit a trouble ticket. Do any of you know where else we could go to escalate the issue? why not just using transparent PNGs? I never had any issues with PNGs and I use them for a long time. I could use png's however all the clients current email builds and pre-existing builds use gif with transparent background. To go back through and update every email would create a lot of work. Trying to avoid having to do so much manual updates. Exactly the same reason for me - though if this issue doesn't look like it's going away any time soon, I'll have to make the changes across all templates. Because I have a few designs that have some really cool animated GIF ontop of a background... Så the fact that Google fills out the transparent areas really mess up my designs. Bump Google changed it back! transparent GIF's seems to be working again in Gmail - Praise the lord of the interwebz! YESSSSS!!! Nice, it looks to be working on my end also. Thanks to whoever fixed this issue at Google. I was having this issue a week or so ago and it does appear to be fixed. I was getting red boxes in my transparent gifs, but they are not showing now. YAY!! Hello Filip. Yeap, I'm sure. In gmail web client, gif with transparent bg has white color. Hmm... for now I just change it to png. Anyway thank you for the reply. Last time this happened, I made an email full of different transparent GIF found on the web. This is something I would humbly call The Greatest Email in the World. 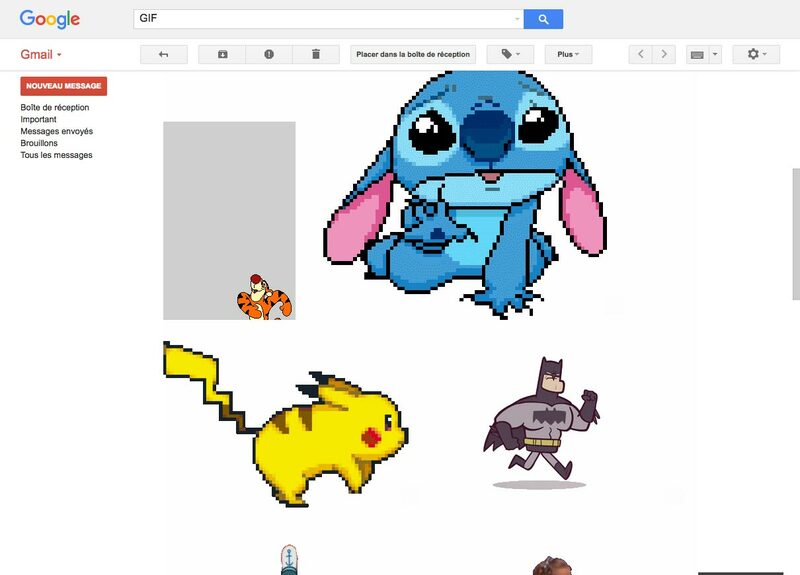 I just retested it and Gmail seems to break some animated transparent GIF (at least the one with Tigger). I'm not sure what's so special about this image in particular. Maybe trying to encode it a different way could fix it.